Mojacar is a municipality located in the region of Almeria Levante, situated close to Garrucha and bathed by the Mediterranean Sea. The town is located near Sierra Cabrera and noteworthy for its narrow streets and the beautiful view of its surroundings. Among the main reasons why tourists choose to visit Mojacar are the sea, the climate, the nature that surrounds the city and its history. The area occupied by Mojacar was inhabited since ancient times; around 2000 BC it was a Greek settlement known as Murgis-Akra, a name that bears a striking resemblance to the present one and which would become known by the Romans as Moxacar. With the entry of the Muslims in the south of the peninsula they took control of the town called by the Arabs 'Muxacar' after the fall of the Roman Empire; it was a period of great growth for the town until the inevitable confrontation with the Christian armies during the year 1435, which ended in an agreement of coexistence between Muslims, Jews and Christians, which led to growth and expansion of Mojacar until the early eighteenth century. Mojacar4 was suffering a great tendency to lose population since the mid-nineteenth century until in 1960 the tourism boom reversed the process. 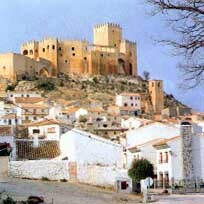 The best way to visit Mojacar is parking the car near the municipal soccer field and walk to appreciate the beauty of the Arabic and medieval architecture. From Plaza Nueva there are stunning views of the Valley of the Pyramids and of Old Mojacar, the first prehistoric settlement of Mojacar which was built along the river 'Agua' and is preserved as the Old Town. As a curious note, it is said that Walt Disney was actually born in Mojacar, and after emigrating to the U.S. his mother gave him up for adoption. A village surrounded by nature with beautiful hiking trails or mountain biking tours. Diverse dishes with local vegetables and seafood you will definitely enjoy. 17 kilometres of coastline where you can practice water sports or sunbathing on one of its wind protected coves, beaches to practice naturism and where to enjoy a wonderful Mediterranean climate with mild winters and summers thanks to the protection of the Sierra. Festivals such as Moors and Christians, which represents the battle and mutual respect that both sides developed to live in peace. This festival is held during the month of June and attracts numerous tourists every year. The route to get from Malaga to Mojacar passes through Almeria and Nijar; take the right turn once reached Los Gallardos as Mojacar is very close. In the map below you can see clearly the route by road to get to Mojacar. Remember to check our prices to rent a car or taxi from Malaga.